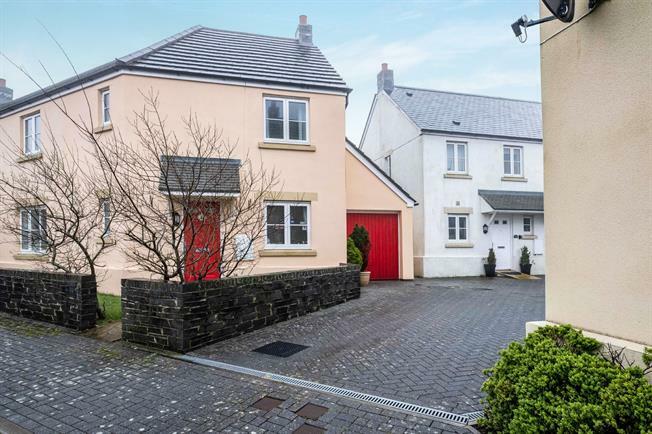 4 Bedroom Link Detached House For Sale in Camelford for Guide Price £225,000. We are pleased to bring to the market this four bedroom linked detached home on the popular development of Weeks Rise. The property benefits from four bedrooms, to include a master en-suite and family bathroom to the first floor. The ground floor consists of a lounge, cloakroom, study and kitchen/dining room with French patio doors opening onto the enclosed, low maintenance rear garden. The property also features an attached garage with off road parking to the front, double glazed and oil central heating. Viewings are advised. Carpeted flooring, radiator, stairs rising to first floor with under stair storage. Double glazed uPVC window facing the front with carpeted flooring and radiator. Double glazed uPVC window facing the front, radiator, carpeted flooring, feature fireplace with inset electric fire. Vinyl flooring, radiator, uPVC patio double glazed doors opening onto the garden. Double glazed uPVC window facing the rear overlooking the garden. Carpeted flooring, radiator, double glazed uPVC window facing the front. Vinyl flooring, fitted with white suite comprising of low level WC, pedestal basin, panelled bath with mixer tap and shower over head. Partially tied walls with radiator and window to the front. White suite fitted comprising of low level WC, pedestal hand basin and shower tray with power shower. Radiator and uPVC window to front. Carpeted flooring, radiator, double glazed uPVC window facing the rear overlooking the garden. Carpeted flooring, radiator, built in wardrobe, double glazed uPVC window facing the rear overlooking the garden.